After an initial entrance from Miguel Muñoz in blue workmans’ overalls (ostensibly to fix the prominent onstage lighting, which the performers continue to manipulate throughout the show), he returns momentarily in a vibrant orange suit jacket to begin the oncoming parade of clowns who line up in front of us, making a wonderful connection with the babe-in-arms behind me; some characters appear before us endearingly awkward, others basking in the limelight. Each brightly monochromatic costume highlights the personality of the clown before us. 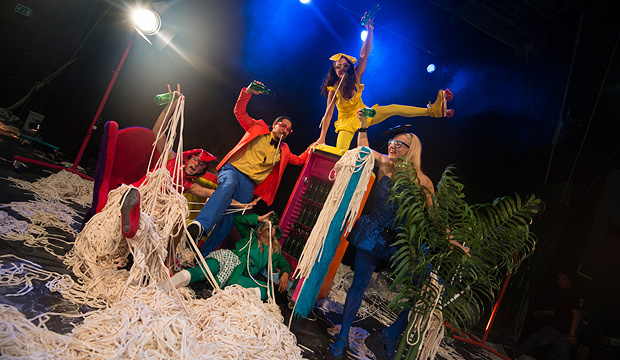 As they wonder what happens next, noodles begin to appear from their mouths to glorious chomping sounds, and the characters fall into a feeding frenzy among the piles of string noodles littering the stage. So far, so good. Klara Mossberg climbs into a dangling section of ropey noodle and begins spinning and twisting, while the audience are kept entertained by fart noises erupting from the sound track of gobbling and guzzling. As I am beginning to feel a sparseness of action, an announcement is made declaring a technical difficulty, and the curtains are closed while the company rectify the problem (which seems to stem from the overhead rigging – perhaps an example of the challenges faced by aerial companies touring outside of their own purpose built structures to traditional theatres? Although, by this stage, they have been in this venue almost two weeks). Cristina Geninazzi’s improvised announcement at the recommencing of the show is winning and apologetic, and the following number from Lisa Angberg on the problematic central rig of three bungee-strung noodle stirrups is invigorated by the thrill of danger, knowing that things were ‘not quite right’ a moment before. Nevertheless, my overall feeling from the show is one of emptiness; the ropes dominate here, the humans are incidental. This is a show which relies on the absurd, and some lovely visual effects, but which lacks substance. ‘Noodles’ as a theme doesn’t really go anywhere, and I’m left wanting some human relevance and resonance. Muñoz is a charming showman, and presents some pleasing sleight-of-hand illusion; Zenaida Alcalde’s cloud swing earns an applause as she hangs by the back of her neck; the four women’s carefully choreographed fumbling jungle-gym crossing of the stage looks more fun to indulge in than watch and, as Alcalde positions herself in a catcher’s hold, I think we will at last be treated to something acrobatically spectacular but, alas, a few brief flings are over too quickly. Directed by Maksim Komaro, ‘Noodles’ is a show that appeals to the senses – with slurped eggs, sniffed shoes, fluffy wheelbarrows and shiny plastic bows – but fails to supply any meat for the intellect. Angberg maintains a competent hand-balance display whilst handfuls of noodles are thrown at her by the other performers, and later performs with Mossberg in a tight wire duet after its awkward rigging transition. Throughout the performance, I feel taunted by the possibility of what could be about to happen, but never materialises. An incongruous Marilyn Monroe costume for Mossberg’s final coquettish parade across the wire – complete with fan-blown skirt – is another example of the preponderance of abstract imagery over threads of purpose. The show leaves me feeling unsatisfied, and perhaps this lack of nutritional value (to paraphrase a surreal cat clown’s scatalogical monologue) is the point. I’m sure the number of walk-outs towards the end are the result of the unfortunate delay and tight festival schedules. Nevertheless, if the production had gripped us more strongly, perhaps people would have been more inclined to stay? Tagged as aerial, Circus, cloud swing, Clown, cristina geninazzi, critique, Edinburgh Fringe Festival, hand balance, klara mossberg, lisa angberg, magician, maksim komaro, Marilyn Monroe, miguel muñoz, NoFitState Circus, noodles, Performing Arts, review, rigging, ropes, sleight of hand, tightwire, zenaida alcalde.